Frequent Wright-collaborator and VJ-extraordinaire Osymyso has been hard at work making seven video remixes of the film, which have been drip-released across the last week as exclusives on a variety of not-as-good-as-Ultra-Culture movie blogs. Rather than send any more traffic their way, I’ll direct you to this Youtube channel, which has all the remixes in glorious 1080p. The sixth and final book in Bryan Lee O’Malley’s comic book series, entitled Scott Pilgrim’s Finest Hour, was released on Tuesday. You can get it on Amazon for slightly over a fiver. Edgar Wright has touched down in San Diego for the annual blogosplosion that is Comic-Con. He’s promised ‘surprises’ for today’s big panel. 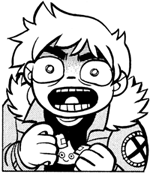 The Scott Pilgrim game is due for release on August 10th. You can watch a trailer for it here. I won’t say any more about it because I don’t really know about video games. 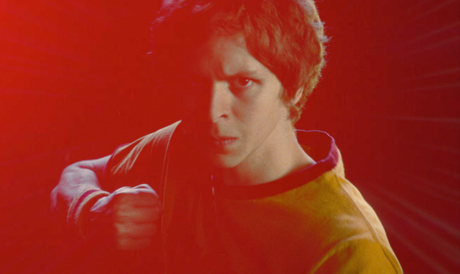 Tickets for the UK’s biggest and best Scott Pilgrim vs. The World preview, a.k.a. Ultra Culture Cinema #04, will go on sale soon. To be the first to find out, join the mailing list. It’s going to be ‘a night to remember’.